This section introduces one example using R core audio interstage and output transformer: SV811-3 Single-Ended 12W Monaural Power Amplifier. This is a high power amplifier that outputs 12W being 50% more than 300B. The main feature, however, is first and foremost easy to make by its configuration of both the power supply voltage less than 500V and the inexpensive parts commonly available in the market. SV811-3 is a power tube developed by Svetlana, Russia basing on the transmitting tube 811A. This is a very beautiful tube having a brightly shining thoriated-tungsten filament with plain plate encapsulated in a large-size perfectly transparent glass tube without getter. Typical operation designated by the tube manufacturer requires the supply voltage 500V or above. Also requires a high voltage drive source. Requires high impedance output transformer because of its high plate resistance. Hum noise is not negligible because of high filament voltage. We can enumerate several difficulties for using it as above. But if these disadvantages are overcome, this tube represents aspects more adorable than 300B in addition to brightly shining operation outlook. The design objectives of this amplifier are high-performance, easy to collect component parts, and easy to build. The tube operation is class A2 that is driven up to grid + field in order to obtain the power efficiently with the supply power voltage 500V or below. Plus, fixed bias system is employed for efficient use of the supply power voltage. Up to about 5W, the operation is class A1 and from 5W and above class A2 that is driven into grid + field. The swing voltage at the grid is about +35V when outputting the maximum power. The required input voltage at this point is 220V peak-to-peak, namely about 78Vrms. Since the grid current flows in grid + field, a powerful driver stage is necessary not to suffer the grid current and to supply high voltage. 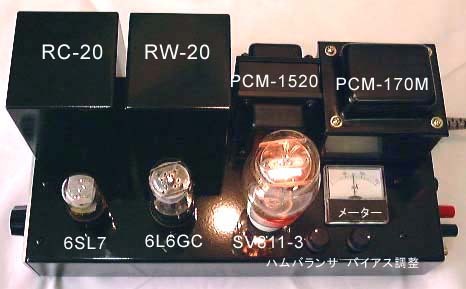 Output transformer is RW-20. As this is 3-stage amplifier, the primary and secondary of the output transformer is connected in negative phase connection. The fixed bias circuit must absorb the grid current flowing in the grid of SV811-3 not only supplies the negative voltage for biasing the grid of SV811-3. When the grid is swung into grid + field, the signal is rectified by the grid and thus generating DC component. By this, the grid voltage goes further to negative side, which reduces the plate current and thus suppresses the output increase. In order to increase efficiently the output power, the fixed bias circuit must retain the bias voltage constant even if the grid current flows. 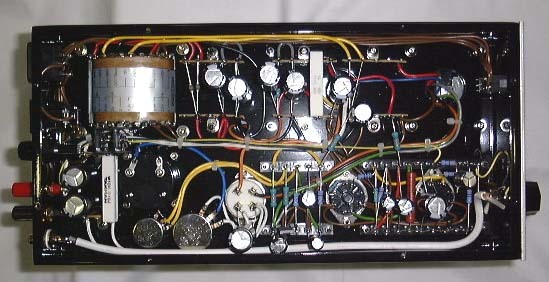 In this amplifier, a MOS-FET source follower circuit is installed after the normal fixed bias circuit to absorb the grid current. The reason of lay outing Nch MOS-FET on the opposite side to the general voltage regulator source follower is that the grid current works to increase the bias voltage not to decrease it. Nch MOS-FET consumes the current from the grid that works to increase the bias voltage and thus keeps the voltage on the grid constant. The combination of 6L6GC triode connection and RC-20 interstage transformer obtains high power without being affected by the grid current. The connection of RC-20 interstage transformer is primary in series and secondary in parallel positive phase connection. Slight step-down operation 1: 0.9 enables high current supply. The secondary of RC-20 is open (without load). This enables both to obtain the natural and unconstrained sound quality proper to open operation and to feed entire supply current from the interstage transformer to the grid of power tube. The operating condition of 6L6GC is effective plate voltage 290V, plate current 24mA. In the circuit diagram, the 1st pin (NC) of 6L6GC is connected to the 6th pin. This is a gadget to use as driver also EL34 (6CA7) that has independent suppressor grid. The voltage amplification stage uses 6SL7-1/2. The half unit is left unused and all electrodes of this unit are grounded. By setting high plate load resistance, 240Kohms, to obtain high gain and large time constant of high frequency, an appropriate stagger ratio is obtained between the time constants of high frequency of driver stage and output stage. Despite of the existence of interstage transformer, this amplifier employs 5dB major negative feedback. This is because the damping factor without negative feedback is only about 1.7 due to the higher plate resistance of SV811-3 compared to 300B etc. By employing 5dB negative feedback, the damping factor can be set at an appropriate level: about 3.7. Good phase characteristics at high frequency both of interstage and output transformer as well as appropriate stagger ratio with the first stage make possible a stable negative feedback across the circuit that contains two transformers. No phase correction is necessary for feedback.. Stable Square wave response has been obtained. Power transformer is a reasonable PCM-170M of Noguchi. DC 470V is obtained by diode center tap rectification of AC 350V. Choke coil is a multipurpose PCM-1520 of Noguchi. Electrolytic capacitor 400V 100uF is a small-sized general purpose radial type made by unicon that has once been distributed by Softone. Negative voltage supply for fixed bias is -405V that is made from AC 290V center tap rectification. Power supply 6.3V 4A for SV811-3 filament must be DC because AC generates considerable hum noise. Efficiency is required for high current. Two windings 6.3V 3A of PCM-170M are connected in series and then rectified using the midpoint as center tap by 5A schottky barrier diode F5KQ100. This reduces by half the loss caused by diode compared to bridge rectification. filter consisting of 0.1ohms and 10000uF X 2 after the rectification reduces by half the ripple component. Chassis is a Softone's MS1. Shorter sides are used for front and rear. Setting two chassis side by side as stereo amplifier will have the same width as full size component amplifier. As SV811-3 is an entirely transparent glass tube without getter, we selected 6L6GC and 6SL7 that have no getter on the top of the glass tube. 6L6GC is no brand made in Russia and 6SL7 is made by NEC for communication. 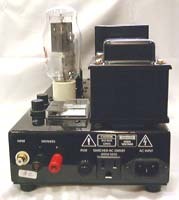 On the right end is an ammeter indicating the current of power tube. The knob just below the ammeter is a potentiometer for bias adjustment. Between the potentiometer for bias adjustment and the power tube is a potentiometer as ham balancer. We recommend one-point grounding at the fixing screw of the first stage 6SL7 socket. Two-point grounding that connects to ground also near the power transformer is not recommendable. Since the first stage 6SL7 has high impedance, it is inducible from outside. Move your hand closer to 6SL7, and then the hum noise increases. Select a 6SL7 that is hard to be induced. Another half of 6SL7 is left unused. Connect to ground the cathode, grid, and plate of this unused half unit. Mount a small heat sink to diode F5KQ100 for power supply of SV811-3 filament. Large size ST tube under shining operation is, first of all, very much impressive. Beautiful operating feature of SV811 surely puts 300B in the shade. First impression when starting to listen to music is good sound quality at fortissimo. Loud sound comes out without being deformed and whispering sound behind the loud sound can be heard without being masked. Consequently, the dynamic range of musical performance becomes audibly expanded. Sound balance is toward mid and low. It seems that modest high range stands on clear mid range and solid low range. High clearness of mid range has vocal heard quite vivid. Is it an advantage of two monaural amps? Both auditory sound and localization are superior representing sound images lined up in depth between the loudspeakers. Output increases linearly up to 12W. The waveform does not lose shape drastically beyond 12W and the output increases gradually up to about 15W. Even without NFB, the frequency bandwidth is 25Hz to 20KHz (+0, -3dB) covering approximately the audible frequency range. Despite of transformer coupled 2-stage circuits and open secondary winding of interstage transformer, the attenuation characteristics are ideal both at low and high ends presenting no peculiar peaks or dips. The low-end attenuation at 10W output is due to the saturation of output transformer. With 5dB NFB, the bandwidth expands 15Hz to 40KHz (+0,-3db) keeping a fair characteristics without peaks or dips. In each case, the waveform is fine. The output is quite stable with capacitance load. It proves that SV811-3 has excellent linearity and a low distortion tube equivalent to 300B. The curves of 100Hz and 1KHz represent a low distortion in wide range, which suggests effective distortion canceling. On reaching about 5W, the operation switches from class A1 to A2 where the grid current flows. At this transition point, the distortion factor continues smoothly. This proves powerful driver stage and excellent performance of bias circuit that absorbs the grid current. Both 100Hz and 1KHz contain lower harmonic components around 4th harmonic up to 1W and the higher degree becomes the lower the distortion, which presents excellent harmonic distortion characteristics. At output 6W, many higher harmonic components appear and odd number degree components are greater than even number degree components. This indicates that the waveform is deformed by the influence of grid current and other factors. 0.9mV of residual noise level is satisfactory for the power tube having 6.3V filament. The components of residual noise would be 50% from filament and 50% from induction hum of first stage tube 6SL7. As the noise level varies considerably depending on the first stage 6SL7, it is necessary to select no-noise tube. Without non-NFB, the damping factor is low, 1.7. There is concern that it comes short of damping in low range for some kinds of speakers. 5dB NFB increases the damping factor to 3.8, suitable for various kinds of speakers. SV811-3 is made by Svetlana, Russia. San-ei Electric (Phone +81-3-3251-0232) on the 3rd floor of Tokyo Radio Department Store (in AKIHABARA) sells this tube at a bargain price @ 3,500 yen. This price is absolutely a great deal for this tube.6L6GC is a no brand Russian tube. Any brand may be acceptable because of its light operation. But 6L6, 6L6G, 6L6GA, 6L6GB, etc. cannot be used because about 400V is charged on the tube at power on until the tube warms up and the plate current starts to flow. This voltage exceeds the maximum rating of these tubes. Be sure to use 6L6GC. We use NEC brand 6SL7 in stock. It is necessary to select a tube of low induction hum noise. 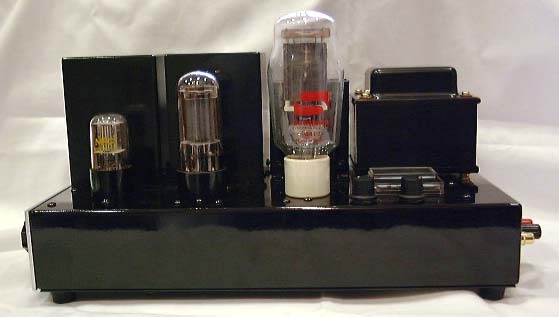 Buy several types and pick up low noise tubes. Most resistors (2W, 5W) are incombustible (metal oxide film) resistors. 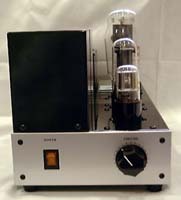 Its performance and stability may be suitable for the tube amplifier operating in high voltage. 10W resistors are wire wound type. Interstage transformer is Softone RC-20 and output transformer is Softone RW-20. It would be possible that the interstage transformer can be replaced with Tango NC-20F, and the output transformer with XE-20S or FW-20S. However, the stability of NFB must be checked on the amplifier. We use Softone MS-1. This is a punched and painted easy-to-build chassis. We recommend UL1015 standard wires . AWG22 meets the case for low current path wiring and AWG20 for high current path wiring. Too large size wire would be difficult for wiring. The table below shows the parts necessary for one unit of monaural amplifier. Only main parts are listed. Screws, wires, and small parts omitted in the table are also necessary. Please note that there are unknown or uncertain descriptions on some manufacturers, shops, and prices.